It must be difficult, nay harrowing for anyone in Uxbal’s shoes to look at the embalmed body of their father, whom they’ve never met, decades after the father’s death. Not for Uxbal. For Uxbal it is a gift that redeems him. Watching Uxbal so lovingly look at the embalmed body, relishing the peace his dad has found, which he himself might find one day, one is simultaneously filled with both sadness and joy. Such is director Alejandro González Iñárritu’s Biutiful. A seemingly un-beautiful (dark, tepid) composition on reel that sinks into one’s soul with every passing frame finally redeeming one’s spirit beyond joy and sorrow, good and bad and most importantly beyond life and death. Biutiful wouldn’t be so dark, haunting, tragic and retributive, and simultaneously uplifting, cathartic and redeeming if not for the character of Uxbal played with absolute conviction by Javier Bardem. Uxbal is a man of many deaths. He sees the dead and helps them ascend on their journey, exploiting his gift for a small fee; a part of him dies every time he does this. His survival is at stake forcing him to sell the grave (or ‘niche’ as Uxbal says) that houses his father’s embalmed body; a part of him dies again. As a hustler who does odd-jobs and arranges illegal immigrants for his employers his heart dies of guilt when he realizes that he is to blame for their pathetic condition. And the final death blow is literal when death comes knocking at his door as cancer. In short, Biutiful is the haunting journey of Uxbal that finally comes full circle surprising both Uxbal and the audiences alike. Iñárritu too doesn’t fail to surprise. Themes that depict the intertwined nature of life, the inevitability of death, the catharsis of redemption are second nature to him. Before Biutiful, 21 grams was probably his best cinematic redemption. Or so we thought. But with Biutiful, Iñárritu speed-walks his filmmaking evolution by transcending to the after-life and the spiritual. Instead of relying on his hallmark non-linear storytelling, Iñárritu goes almost linear, relying more on the nature of the story to depict the non-linearity; instead of jumbling up events in his editing window, he jumbles up the protagonist’s belief to depict chaos; and for the first time, instead of showing multiple intertwined narratives, he focuses on Uxbal’s story which in itself is intertwined with the larger scheme of life. Not one to disappoint the audience, Iñárritu does employ many of his characteristic quirks. Shot in the dark, dingy and shady by-lanes of Barcelona, the camera follows its subjects in obtrusive ways. Oh! And don’t forget to relish the spiralling cigarette-smoke shot; probably an overdone style in World cinema and by Iñárritu too. Like in 21 Grams, where the motif or the entire concept of ’21 Grams’ is unveiled at the very end, here too he discreetly uses birds, butterflies and most importantly owls as a motif to add an important layer to the film’s meaning. The subplots too, like in his other movies, are crucial to the central character’s existence. Uxbal feels guilty and attributes his current state of suffering to his misdeeds with the immigrants. Being a family man himself who loves his children and to some extent his ex-wife with a bipolar disorder Marambara (an equally competitive performance by Maricel Álvarez), Uxbal is moved by the immigrants’ plight of being separated from their families and motherland. Helplessly he tries to help them only to fall deeper into the guilt pit. Yet there is hope. 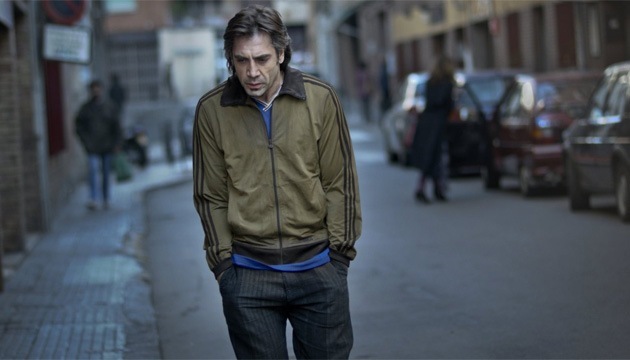 Biutiful is multi-layered and is open to multiple perspectives more than interpretations. For instance, in the end we see Ige’s character (an African origin immigrant) facing a dilemma: to return to her motherland or come back to be a mother to the soon-to-be fatherless children of Uxbal? Ige’s character as such plays a pivotal role in lending hope to a dying Uxbal. Or does she come back for her own selfish interests? Maybe she doesn’t come back after all? All this leaves much room for interpretation and perspective. Overall, Biutiful is a spiritual perspective for those who believe in cause-and-effect, sin and deeds, and karma and after-life. An emotional perspective for those who relate to human feelings. A realistic perspective about the pitfalls of globalisation. And above all a humanitarian perspective for mankind who believe in the triumph of the human spirit. Tags: 21 Grams, After life, Alejandro González Iñárritu, Biutiful, death, Destiny, Javier Bardem, karma, Maricel Álvarez, perspectives, Review, sin, Spiritual, Uxbal. Bookmark the permalink. Prakash – I love how this film has spoken to so many people on so many levels. It’s rare to find a film so layered with meaning and private take-aways for the audience. Your labeling of Uxbal as “a man of many deaths” is most apt. You make a good case for the subplots that has caused me to rethink my original position (though I still say the Chinese bosses’ plotline was unnecessary, but the Chinese workers’ story was appropriate to ad another layer of understanding regarding Uxbal’s relationship to the world and people around him). Bottom line: I can’t wait to watch this again on DVD to relish in the refocused details and pick up on things I dismissed initially. Your summation at the end speaks to the film’s universality and humanistic approach to life & death. Upon second or third view this might top 21 Grams in Inarritu’s canon, though I will reserve that final judgment for later. Fanstastic write-up! This ranks with your Inception review as one of your best! Exactly. The beauty of this film lies in the ‘eye of it’s beholder’. The Chinese bosses and the ‘gay’ part was definitely redundant; but it probably adds up to picture the exploitation effect. In-fact, I even found Uxbal’s brother’s role quite redundant. But then don’t you think if we were to write a screenplay we would probably add these teeny-weeny extra diversions as a sort of ‘relief’ from the heavy-layering the movie already has? I don’t know, I am speaking more as a ‘writer’ here than an ‘audience’ or ‘reviewer’. Thanks a ton David! I am glad you rate my review on-par with my Inception review. A major part of the credit for our good reviews should go to the directors who make insightful and aesthetic cinema that acts as fodder for our reviews. I have gone slow on my reviews since a year now, concentrating on other forms of writing (I’ll post a blog on that shortly). But Biutiful literally shook me up from my slumber and I couldn’t resist reviewing it. Added a link to your review too. Why is the name spelt the way it is? Any idea brother? Nice to hear from you. Well, the movie is in Spanish. I am not too sure but maybe in Spanish it’s written as ‘Biutiful’. The other reason might be a scene in the film where Uxbal’s daughter Ana misspells it as “…the Biutiful Pyrenees”.